Like many other Development Operations (DevOps) teams in software today, LucidLink uses Jenkins as our core platform for continuous integration and test. And like many other DevOps teams, managing and backing up the underlying storage is a challenge and a distraction. Currently LucidLink supports 5 different OSes which results in running 12 different builds, and over time our build artifacts have increased in size. At the time of writing, each build is roughly 1GB in size. We push a nightly release build for each of the supported platforms. We also manually create custom builds for individual feature development, and employ static and dynamic analysis tools. A new release build is triggered when branch builds are merged into the master. The result is that every 2 to 3 days, we end up with around 30GB of archived artifacts. We originally did our best to plan, estimate, and pre-allocate the storage that we thought we would need as per best practices. We would often choose not to archive certain things that we deemed unnecessary for the purpose of saving on storage space. 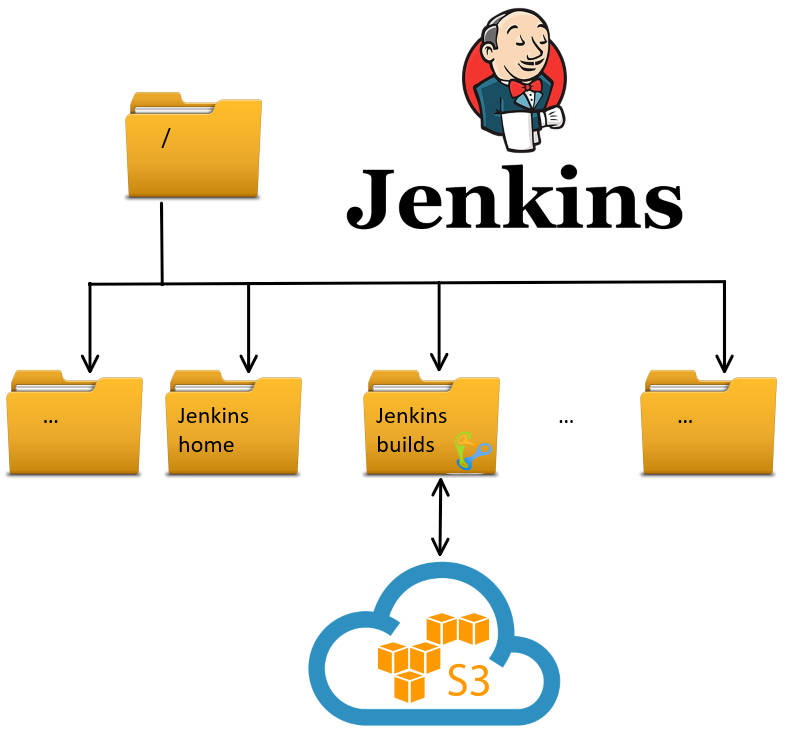 However, hitting the limits of traditional storage are inevitable, and before long we were looking at the time and resource consuming task of migrating our master Jenkins instance in order to increase the storage. Wouldn’t it be great if we could simply mount an object store and make use of its elasticity, durability and low cost instead? No solution out there was really any simpler, and required significant changes to our existing infrastructure along with a lot of added complexity. Luckily for us, LucidLink is in the business of building a distributed file system using object storage as a backend and supports all the OSes we need (including Linux)! And with our beta headed out the door, it was time to eat our own dog food for critical business applications. In fact, it was a version of this very challenge which sparked the idea for LucidLink in the first place. Following is the step by step process in implementing LucidLink in our very standard Jenkins instance. From 30,000 ft level, implementing a LucidLink filespace is a pretty simple thing. We leverage AWS S3 as the back-end storage, overlay a distributed, streaming architecture, sell it as a subscription service, and implement on your devices as a configurable mount point. Here is what you need. An AWS account, make sure you have your access key and secret key handy for a one time configuration. Subscribe to the LucidLink service on AWS marketplace. Download the appropriate LucidLink client for your OS. There are three major init systems in the Linux world: System V, Upstart and systemd. They are all completely different. System V is the oldest and its scripts are stored in /etc/init.d/. Upstart is something in the middle – it supersedes System V, but it’s already deprecated in favor of systemd. Upstart‘s scripts are located in /etc/init/. systemd is the newest init system. Our Jenkins master machine is with Ubuntu 14.04.5 LTS and supports the following two init systems: System V and Upstart. Unfortunately, Jenkins’ service configuration is written for System V (/etc/init.d/jenkins). Supporting System V is a bit hard and it’s not that flexible. For this reason, we implemented the Lucid service as an Upstart service. Upstart services may depend on each other, but cannot depend on System V services (neither can System V services depend on Upstart services). On the other hand, we need to start the Lucid service before starting Jenkins. To workaround this, we should first stop the auto start of Jenkins and then let the Lucid service manage the Jenkins service. in general, the code in script/end script section in an Upstart config file is executed by /bin/sh and not by /bin/bash. This is a significant difference (i.e. expressions like “if [[ …. ]]” cannot be used). 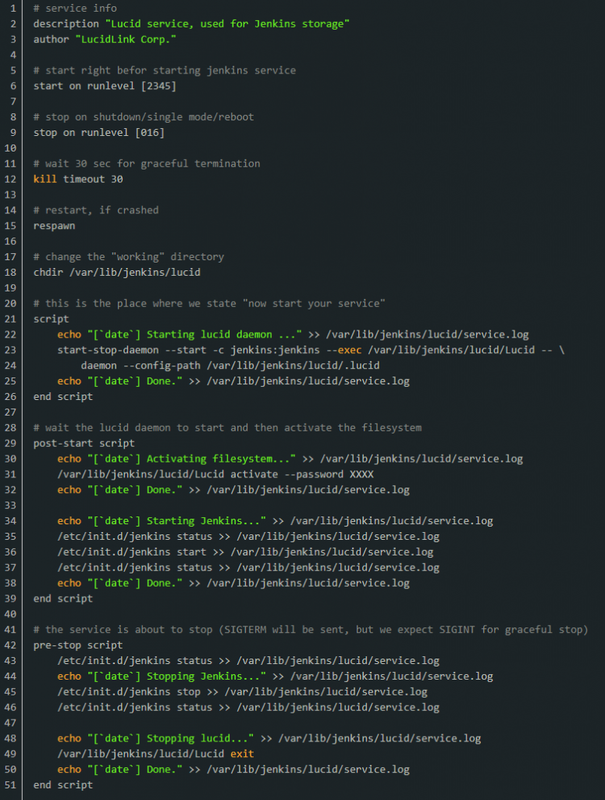 We have a script to share upon request: lucid.conf – the actual service configuration; note, that this is an Upstart service configuration (and it also manages the jenkins service). stop Jenkins service before stopping Lucid. Jenkins’ service is System V and the host supports Upstart init system. Note: make sure there’s no running Lucid process. The storage grows on demand, and only pay for what we use. We now can easily (and cost effectively) save all our build artifacts without worry about capacity. All data is encrypted from the client; our IP is fully protected. The data is extremely durable, protected by S3’s underlying multiple replication. We can access artifacts from anywhere, any machine. Performance was not much of a concern before, and if anything it has improved. This approach could be utilized for any process or utility within the DevOps space where you want to elegantly replace local storage (physical or EBS etc.) with object storage.